The Castaways (a VSS Enterprise property) re-christened in March, 2000 stands tall as she proudly shines 19 stories above the surrounding areas. Just outside the Downtown area and a 5 minute drive to the Fremont Street Experience (1 mile) the Castaways offers plenty to do for the vacationing traveler from looking for excitement in the newly remodeled casino to lounging carefree poolside. When it's time to relax, retire to one of the 400 plus deluxe rooms and suites. Guestroom features include coffee makers and hair dryers, satellite TV with Pay-Per-View movies and even exciting Nintendo 64 video-game action. Here on business Castaways features a special Hospitality Suite that is perfect for small meetings or entertaining. Conference space and reception areas are also available. If you're parking an RV or a Volkswagen, our parking lots can accommodate both. Free valet parking is available 24 hours a day or guests can utilize the hotel's six-story lighted and patrolled parking garage and larger back lots. You'll easily find a spot. Want to stay in your RV? Castaways RV Park is an excellent choice. We offer weekly and monthly rates and discounts for Good Sam members. Some pet restrictions apply. Castaways looks forward to offering many more options to the Vegas Visitor as it unveils it's plans for expansion with a 500 room tower and more meeting and convention space. Some tasty new restaurants along with Executive Styled suites are also in the works. A historic name filled with tradition that also stands for the very finest in hospitality service and excitement: the Castaways! 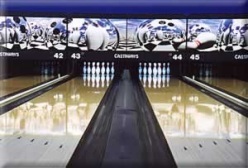 Whether you're a novice or pro, you can choose from 106 lanes at Castaways -the largest bowling complex in North America. There's plenty for Bingo players with over 400 plus seating and games starting every hour on the half hour. Castaways also welcomes golfers with great rates and tee times. Be sure to enjoy one of Castaways' fine dining experiences at either our San Brisas Buffet (choose between our Aloha menu with authentic Hawaiian entrees to Steak-n-Pasta) or the Las Vegas favorite Seafood Buffet. For a more elegant atmosphere spend an evening in our Prime Cut Steakhouse. If you're in a hurry The Pelican Rock Cafe is just for you. Room service is also available. After dining relax with some music in our Windjammer Lounge. The Castaways offers shuttle services through Las Vegas Limo for as low as $5.50 per person.